I recently created a blog, ProgRockFanatic.blogspot.com, which will feature Progressive Rock News, Reviews, Videos and Tour Dates. I've been listening to Pandora a lot lately, to a station I created based on the band Porcupine Tree, and through that medium I've discovered a lot of new bands that I really like. Just in the past couple of hours I've heard familiar bands like Pink Floyd and Tool, but also a lot of bands that previously I've been completely unfamiliar with, like Ozric Tentacles, Gravenhurst, Dream Theater, and Opeth. I got so inspired that I thought I'd share videos, tour dates and other information and try to help promote the style of music in general. As part of that exercise, I'll be trying to rank the blog for the various band names that I'll be covering. One good way to do that is to both include lots of copy and tasty links appropriate to the topic, and then try to get web sites with similar interests (and high PageRank, if possible) to link back in contextually appropriate ways. Check out the blog for lots of great music, that you've probably never heard before. 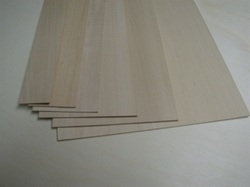 Recently, I've started blogging about Basswood for National Balsa Wood Company as well. I wrote a blog entry about basswood for architectural models and architecture students' student projects. National Balsa is a leading supplier of Basswood for architectural modeling projects and is a favorite of both architecture students and professional architects because of its light weight, ease of carving, and relative affordability. Basswood for architectural models is sold in thin sheets like plywood and can be custom cut to any size or specification.